This guy is so sweet. 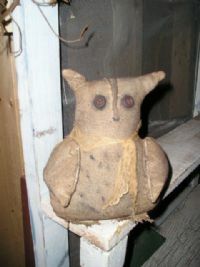 Our aged osnaburg owl with grungy cheesecloth tie is perfect to sit on a cupboard or shelf. 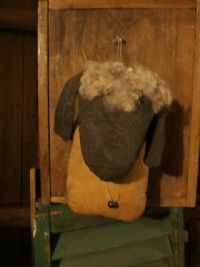 Weighed to stand 8"
Hanging sheep head made from aged flannel and head and ears painted black. Gray sheeps wool for hair on sheeps head. 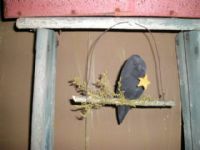 Finished with a hanging bell around his neck. 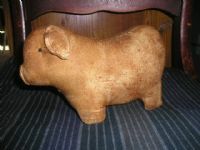 11"
So sweet is our standing grunged muslin pig. 6x9"